Home › blog › The Japanese Adventure Begins! Left northern Florida (JAX) via Southwest. Stopped in DEN and then on to LAX where I was met by my buddy Jason who swept me off to his place to crash. The slight headcold / congestion did very little to dampen the experience. I had breakfast with Jason and his family at a place called Country Deli in Chatsworth CA. Delightful family place which serves a yummy sausage breakfast burrito. After breakfast we visited local fish/reptile shop because they were looking for some things to fix their aquarium. Post pet store, I had a planning session with Mark via Google Hangouts in order to go over some of our plans for the first adventure one I’m in the country. First up? Tropical jungle camping/hiking on one of the southern islands of Japan – Iriomote. Chilled out with Jason and his son while his wife and daughter were off having some girls only chill time. Then the boys made their way to a swanky steak house for a really satisfying meal. 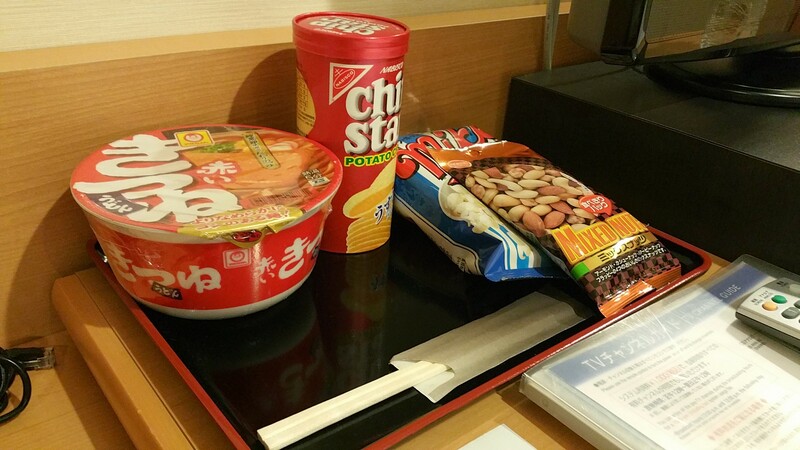 Funny side note: I’m planning on using Japan as a jumping off point to improve my diet. Content of my diet, sure, but the primary focus is portion control. To that end, I was proud of myself for ordering ‘only’ the six ounce steak. Of course, the the portions on everything else about the meal were so ginormous as to render my herculean effort null and void. C’est la vie. Woke up fairly early and reduced / repacked my bags in order to get rid of some of the ‘excess’ that I had collected. Yes, I felt like I had too much stuff with my two bags loaded. I explained to one adorable little girl and her very awesome brother that “That Boy” would come back soon. 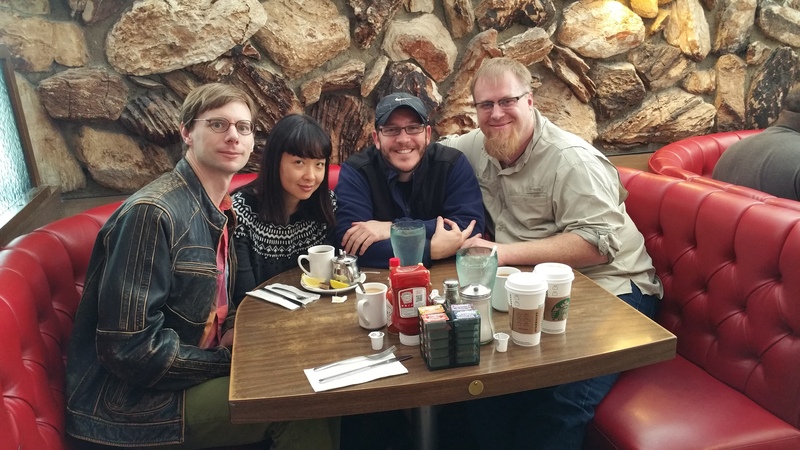 Jason and I made our way to brunch with some dear old friends (Patty and Mike) at a place called Pann’s just outside LAX. Patty and Mike are great human beings. They scratch a very specific itch I have for chatting with crazy creative people who also have more than enough brains to support that creativity. While I’m really blessed with so many folks of that particular mix in my life, Patty and Mike have a different flavor to their creativity that I feel like my life would be greatly reduced without. A chance to hang out with them is something I will never pass on. I also got to consume one seriously yum Louisiana Omellette. Once Jason dropped me off at the airport, my check in went easy on a ridiculous scale. My only objection there was the fact that they forced me to check my backpack because it was a couple kilograms over the weight limit. Not the end of the world, certainly, but I work really hard to keep it to carry on only, so this frustrated me. On the plus side, the woman who checked me in and made the request couldn’t have been more gracious. I suspect that’s a taste of things to come, and frankly, I’m looking forward to that. My take off was a different story altogether. My flight was originally scheduled to leave at 2:20pm. Due to some technical issues with one of the engines, and the need to replace some component therein, we didn’t actually take off until 6:30pm. End of the world? Far from it. It was a little bit stressful, but mostly from the fact that my brain wouldn’t let go of the idea that “there’s something wrong with one of the engines”. Still – they fixed the part, the staff was gracious and responsive, and eventually we were on our way. A side note about the staff of Singapore Air flight SQ011 – I don’t know if I simply ‘lucked out’ or if they have some sort of attractiveness requirement for their staff, but pretty much every crew member on this flight is of model level attractiveness. The men are handsome and the women are beautiful on a ‘my chest aches just looking at this human’ level. None of this really matters for anything, but as it’s a first in my air travel experiences, I thought it noteworthy.